Boom 11,65 m to 60,0 m seven section TWIN-LOCK™ boom. 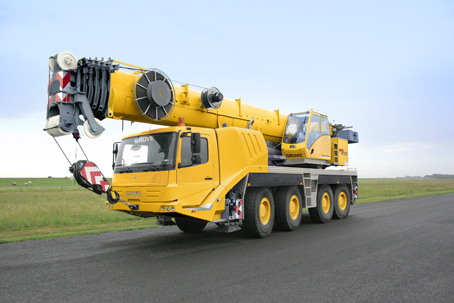 Maximum tip height 63,0 m.
Boom elevation 1 cylinder with safety valve, boom angle from -1,5° to +82°. Load moment and independent anti-two block system and control lever lock-out. These systems provide electronic display of boom angle, length, radius, tip height, relative load moment, maximum permissible load, load indication and warning of impending two-block condition with lock-out hoist function. Cab Aluminium, tiltable (approx. 20°), full vision, safety glass, adjustable operator's seat with suspension, engine-dependent heater. Armrest-integrated crane controls. Ergonomically arranged instrumentation and crane operating controls. Counterweight 6,3 tonnes, consisting of various sections. Hydraulic removal system. Engine Mercedes-Benz OM 904 LA, diesel, 4 cylinders, water cooled, turbocharged, 129 kW (175 HP) at 2200 rpm. (80/1269 EWG - fan rigid). Max. torque: 580 Nm at 1200-1600 rpm. Fuel tank capacity: integrated in carrier fuel reservoir Engine emission: EUROMOT / EPA / CARB (non-road). Hydraulic system 2 separate circuits, 1 axial piston variable displacement pump (load sensing), with electronic power limiting control and 1 gear pump for slewing. Thermostatically controlled oil cooler. Tank capacity: 600 l.
Optional equipment • Bi-fold swingaway, 10/17 m with hydraulic offset and luffing under load(0°-40°), controlled from the crane cab. • Bi-fold swingaway, 10/17 m (manual offset 0°, 20°, 40°). • Lattice extension, 22 m - includes 1x5 m fixed non-offsettable section plus10/17 m swingaway (see above). • Additional 19,8 tonnes counterweight (total counterweight 26,1 tonnes). Outriggers 4 hydraulically telescoping beams with vertical cylinders and outrigger pads. Independent horizontal and vertical movement control on each side of the carrier. Electronic level indicator with automatic levelling system. Engine Mercedes-Benz OM 502 LA, diesel, 6 cylinders, water cooled, turbocharged, 315 kW at 1800 rpm (80/1269 EWG - fan loose). Max. torque: 2100 Nm at 1300 rpm. Fuel tank capacity: 400 l. Engine emission: EUROMOT / EPA / CARB tier 4i (non road). Transmission Daimler Chrysler G 240-16 with EPS (Electronic Pneumatic Shifting), 16 forward and 2 reverse speeds. Two speed transfer case with inter-axle differential lock. Drive/Steer 8 x 6 x 8. Cab 2-man-design, safety glass, driver seat with pneumatic suspension, engine-independent diesel air heater incl. 24 h timer. Complete instrumentation and driving controls. Electrical system Three-phase alternator 28 V/100A, 2 batteries 12 V/170 Ah. Lighting system and signals 24 V.
• 8 tyres, 525/80 R25 (20.5 R25) -Vehicle width 2,88 m.